Even though your dog may be one of the so-called aggressive dog breeds, he can still make a wonderful pet. The key to raising a pet that is safe to be around your family is to ensure the dog is well-trained and well-loved. Aggression in dogs is defined as a tendency to growl, bark or lunge at other dogs and people in an attempt to intimidate. In many cases, the aggression is meant to protect their owner or "turf," and the dog will otherwise be friendly. When watching puppies interact, it is often obvious which ones have the most potential to become aggressive adults because they are the bullies of the pack. Chow Chows are one of the breeds most willing to bite. Originally bred as a working dog, Chow Chows are not the best dog to own if you are not experienced with raising dogs. Chows are extremely protective of their home and owners, and they will ferociously protect their turf. Also, due to the way their brow protrudes over the eyes interfering with their vision, Chow Chows can be startled easily which may cause them to lash out in fear. Pitbulls are another breed often considered very aggressive. Due to their muscular frame and great strength, Pitbulls have been bred to fight by unscrupulous breeders. When purchasing a Pitbull, make sure you know the lineage of the puppy and the reputation of the breeder. Interact with the puppy and watch how he interacts with the other animals to see if he has an aggressive nature. Bullmastiffs are one of the largest breeds of dogs and typically can intimidate other dogs by their size alone. This breed is loyal to their owners and may at times be overprotective. This is especially true when confronted with other dogs, so care should be taken to keep them on a leash. Obedience training is a must with this breed since their size can easily overpower their owners and cause problems. Rottweilers are powerful dogs that have been used as guard dogs for centuries. They are protective of both their owners and territory, and they will fight any intruder. As long as the dog is well-disciplined, socialized and does not perceive danger, he can typically control his aggression. 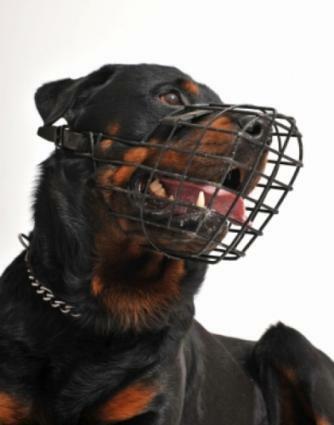 A Rottweiler will display aggressive behavior if he feels a new dog or person is a threat. Doberman Pinschers are an intelligent breed that has been shown to display aggression towards strangers. This dog does not typically show aggression towards people he knows and is not very aggressive towards other dogs. Due to the large number of bite cases involving Dobermans and strangers, the breed is considered aggressive. Care should be taken when interacting with a dog you don't know well. The Papillon's name may mean butterfly in French due to its fluffy ears, but this breed is not necessarily the most lovable to strangers. Papillons are loyal lapdogs, and they do make a good pet in the right household. To fully appreciate all the Papillon has to offer, it may be best to enjoy this pet in a child-free home. Sudden movements and rough play make this breed bark and nip. Although energetic, a Papillon works best when exercised regularly and allowed to spend a lot of time with its owner. Due to the Papillon's intelligence, dogs left on their own too much may show more signs of aggression that is mainly attributed to boredom and a need to be exercised. Dachshunds are a breed you may not have thought would be aggressive since so many families with children own them. If these dogs become overly excited during rowdy play, they have a tendency to bark and nip. Dachshunds are also known for chasing other dogs and animals out of their yard, even if the other dog shows no signs of aggression. Dachshund owners should take care to supervise their pets around children since rough handling may make the dog bite. Chihuahuas, although tiny, are actually one of the most aggressive types of dogs. These dogs seem completely unaware of their size, and they have a tendency to be territorial. The Chihuahua may strike out and nip anyone in the near vicinity if he feels threatened. Children should always be supervised around these dogs for their own safety as well as the safety of the dogs themselves. Jack Russell Terriers are another small but mighty warrior. Jack Russells typically show more aggression toward other dogs than humans. Their aggression manifests itself through barking, snarling and nipping that is intended to scare other dogs away from what the Jack Russell considers his area. In extreme cases, these Terriers will even chase other dogs, even if the dog is larger, to show their dominance. Understanding the tendencies your pet has goes a long way toward ensuring that he is still a good family pet even if he is a member of one of the more aggressive dog breeds. Whether you choose one of these breeds or opt for one of the dog breeds considered least aggressive, it's important to buy your pets from a reputable breeder and make sure you spend time with the dog before you buy to tell if he is a good match for you and your family.